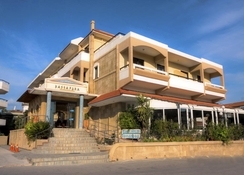 This cosy comfortable hotel is located within 500 metres of Ialyssos Beach and 8 km from Diagoras International Airport. The centre of Rhodes with its Medieval Town is located 9 km from the premises and the port is 10 km away. As the most convenient means of transportation around the island is by car, parking is available on site and free of charge for the convenience of guests. 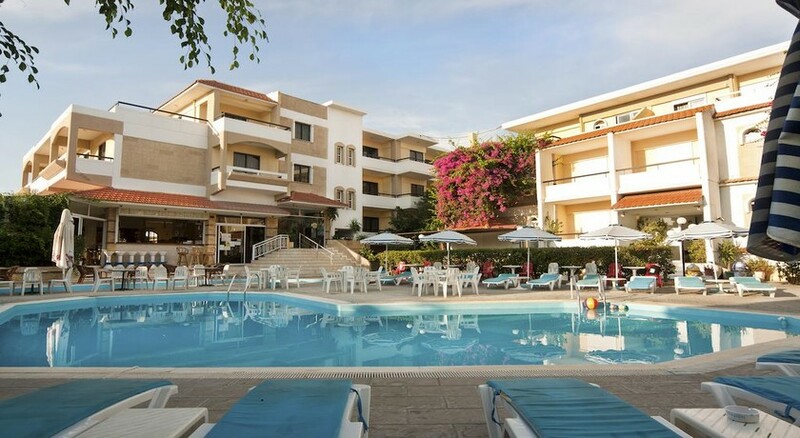 Despite the proximity to the beach, the hotel has a beautiful pool area with sun loungers and a bar, where guests can have a refreshing drink under the shade of an umbrella. All rooms have private balconies overlooking the pool or garden, as well as fully equipped kitchenettes and a dining area, so guests will feel right at home. For a truly relaxing experience the hotel comprises a sauna and a SPA centre with a staff of professional wellness therapists. The staff were friendly and would try to please you if they could. The swimming pools were great. The bar staff were amazing and lots of fun. The food was reasonably priced and delicious. Booked this as a late getaway in June, we had a pleasant stay, although the apartment was very dated with old mahogany furniture etc, it may never have been updated since it was first opened in the 1970s. The air conditioning unit was situated in the hallway, which I felt was very strange. Possibly the layout used to be different at some time. I believe there are modern rooms in one of the newer blocks. Rooms were cleaned regularly and were spotless, food was reasonably priced and tasty and drinks were also reasonably priced. There are two swimming pools, the one at the rear was handily placed for the bar and also had a lawned area with sunbeds, of which were plentiful. Its only a short walk to the beach, where you will find many tavernas along the beach road and a ten minute bus ride will take you into Rhodes town. The bus stop is only round the corner and cost 1.5 euros. There is also a large supermarket round the corner from the hotel which will supply all your self catering needs. Beer was extremely cheap! !